Leaders often encourage their teams to think big and be more disruptive—but to follow through, people need new tools. We believe that learning how to design exponential business models is a discipline all leaders and entrepreneurs can learn. So, how do you design exponential business models? What Is an Exponential Business Model? A business model defines how value gets created and delivered in a company. It is an organized way of laying out assumptions about key resources, partners and activities of your value chain. These include your value proposition, customer relationships, channels, customer segments, cost structures and revenue streams. An exponential business model looks at the same key areas as a traditional business model—but it has radically different goals. Understanding the mechanics behind business models is one of the most important new skills that all innovative leaders must develop. 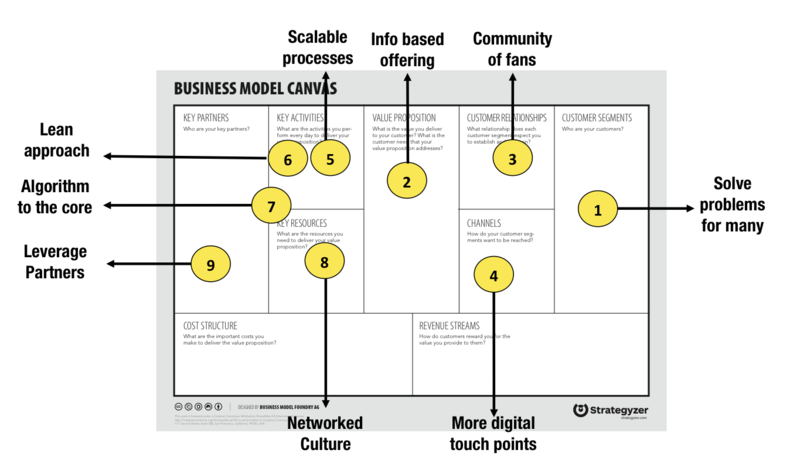 The Business Model Canvas outlines the core elements of a business model in nine essential building blocks. Taking your business model from 10 percent to 10X isn’t simply about scaling. Often it requires a completely new way of looking at your business and the market it serves. Exponential business models require exponential imagination. But it can be difficult to re-imagine your existing business if you only surface ideas from within the organization. Some of the best ideas come from outsiders who offer fresh perspectives on how things are “supposed” to work. To build an exponential business model, try studying other successful and profitable business models, use a common language, make strategic choices, and identify “antilogs” — businesses we don’t want to emulate but can learn from. Further, to 10X your business model, you must create value by leveraging technology in at least one key building block, such as the value proposition, channels, or key resources. Amazon, Facebook, Airbnb, Snap, and Slack are just a handful of the companies that have successfully done so. Airbnb, for example, built a software platform to connect those in need of lodging to those who had it. By combining existing tech with an alternative value proposition, they liberated a huge, underused resource and created 10X value without owning a single room. There are nine design principles to guide your efforts. Each of these is tied to one of the boxes on the Business Model Canvas. Technology is enabling organizations to reach entirely new markets in massive and viral ways. As the world’s population approaches 7.5 billion, companies and organizations with exponential business models can help close the gap between our growing population and the resources they need. Many companies start with one core offering to customers to serve one need—like Uber and personal transportation—then expand their services to meet other needs, like UberEATS or UberHEALTH. As companies digitize their products and services, they aren’t just creating new versions of their traditional offerings, they’re creating entirely new marketplaces. Airbnb’s platform re-imagines short-term accommodations; Slack digitizes collaboration and knowledge sharing; the consumer genetics firm 23andMe offers affordable DNA sequencing to anyone. Every business, regardless of industry, should be exploring how and what to digitize in their existing value proposition to not only serve existing customers better, but to potentially open up foundationally new exchanges of value. When you want to work towards a 10X solution, you need to build your customers into a fan base and then collaborate with these fans. User-empowered customization of basic functions, such as the filters on Instagram, the augmented lenses on Snap and the mashup functionality on Musical.ly allow users to create something unique and share their creations across multiple touch points, acting as a viral distribution and marketing channel. Many exponential businesses are using social collaboration to connect physical and multiple digital outlets to enhance the value of their core offering. Think of this as user-generated content amplified through network externalities—the more people that contribute to the platform, the more valuable the service becomes. The fastest-growing companies use this strategy as a driver of customer acquisition, engagement and lifetime value. The traffic app Waze married GPS data with real-time traffic input from users, using gamification methods to make the process fun and engaging. Waze was bought by Google for $1.3 billion when they had only 100 employees, and it has since become the go-to service for commuters. Technology can help analyze and automate routine activities to disrupt traditional manufacturing or delivery methods. Amazon has long used robots to stock and retrieve products from its warehouses and is getting closer to delivering its products via drones. It also realized one of its most important strategic activities—cloud and data storage—could become a valuable resource for others. Amazon Web Services (AWS)—rented access to computing infrastructure—was launched in 2006. Ten years on, it contributed 56 percent of Amazon’s growth and is on target to be a $100 billion business in less than five years. Why is GE becoming more exponential? They use a lean approach for all core functions in their business, emphasizing rapid cycles of experimentation and learning. By instituting lean processes across your functions, you allow people to take risks, and you gain data about your business that you can study and learn from. Google is one of the best examples of a company built on an algorithm (to rank websites), that is then augmented by machine learning. StichFix, one of the fastest-growing on-demand retail companies, has a team of over 65 data scientists and uses algorithms to drive nearly every part of its business. It even has a well-respected public blog on data science (remember, this is a retail company!). Employees must work in networked ways to socialize and share real-time insights and experiences. Giving employees autonomy to do what they need to in a supportive and open culture decentralizes and speeds up decision-making, opening up the possibility of a 10X business model. Zappos has been one of the early pioneers of building a “holocracy” culture, eliminating professional management positions and empowering workers without additional bureaucracy. Companies like Microsoft are betting long on social software to support spontaneous collaboration efforts, building networking and social functionality into all of their new office suites. Many exponential business models stem from “uncommon partners”—different types of companies from different industries that work together to benefit from integrated value. Drone company Matternet and Mercedes-Benz recently joined forces to create an integrated delivery solution designed to transform how people receive lightweight goods on demand. This last design principle may be the most powerful. Think through whether you need to own all the resources in your business. This question applies to any capital-intensive assets, including equipment, talent, or innovative new ideas. We tend to think we must build internally and focus on identifying and scaling internal ideas instead of spending time scouting out partners or finding resources externally. What uncommon relationships can you build this year? Leaders of business model innovation need to embrace uncertainty, come to the work with a sense of curiosity and patience, and take the time to unpack the learning from what they are seeing around them. Start by crafting a clear massive transformative purpose because if you are not heading for that, then in all likelihood you will not find it. 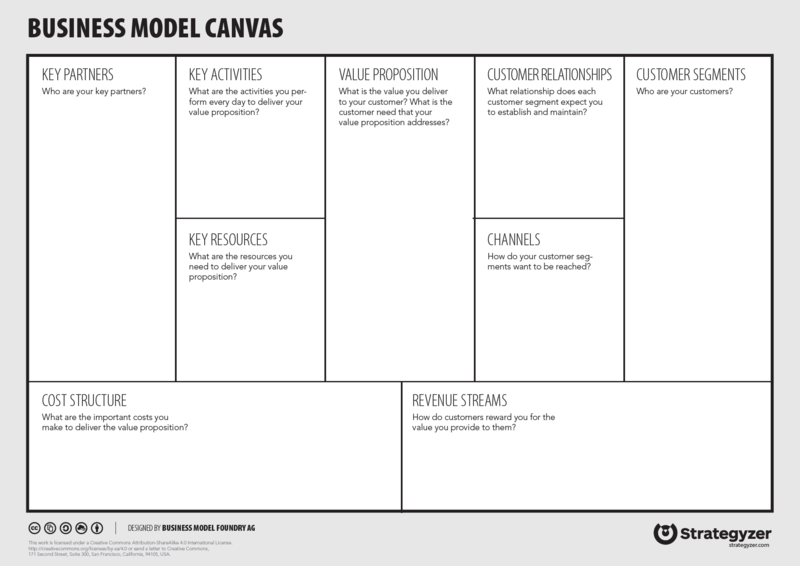 Next, put your own business model canvas together as an ideation exercise, exploring each of the principles in turn. Start to look at your revenue streams and how you actually add value. Study platform businesses and think about how you might bring platforms to help transform things in your industry. Changing your business model is best fueled by technology and talent. Technology can be a liberating force—it allows you to take things that were once scarce and make them abundant. This is true for talent as well. If you can find ways to ignite your talent to work on the most difficult parts of your transformative purpose, you can unlock 10X potential.